VATICAN CITY (CNS) — Catholicism is a faith of extremes where God makes tough demands while always offering his unconditional love, a U.S. bishop told priests taking part in their jubilee for the Year of Mercy. 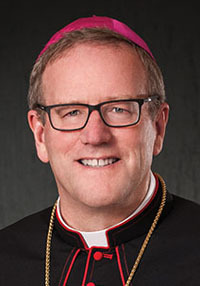 When preaching or communicating church teaching, some priests might emphasize the high ideals needed for holiness and others might underline God’s loving, inclusive embrace of even his wayward children, Auxiliary Bishop Robert E. Barron of Los Angeles told Catholic News Service June 2. But these two poles are not mutually exclusive, he said. “We are not an ‘either-or’ religion, we’re the great ‘both-and’ religion” in which nothing can get in the way of divine mercy — “it moves into the arena of sin, it can never be trumped,” he said. Bishop Barron was one of seven priests chosen to offer a catechesis on mercy during the Jubilee for Priests and Seminarians in Rome June 1-3. He presented his talk to English-language speakers at the Basilica of St. Andrea della Valle June 1. — “God’s mercy is relentless. It crosses all boundaries and borders. It can never be stressed enough,” he said. — It inspires those who receive it to share the good news, embarking on mission, he said. Jesus “makes this very strong moral demand” on the woman and “calls her out” for living with a man who is not her husband, the bishop said. “Both should be part of the same chorus, the danger is reducing the symphony to a monotony,” he said. He said a lot of what Pope Francis says reminds him of his spiritual mentor, the late Cardinal Francis E. George of Chicago. He said the cardinal once told seminarians at Mundelein Seminary, where Bishop Barron taught for more than 20 years, that he greatly admired them for their devotion to the truth. “I think that’s precisely (Pope Francis’) message. He’s not softening the truth, but he’s saying you don’t just drop it on people, you walk with them,” he said. Contributing to this story was Robert Duncan.